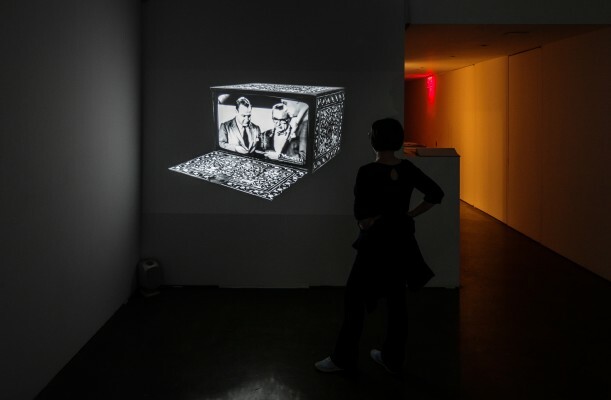 Yossi Milo Gallery is pleased to present WarCraft , an exhibition of video installations by Israeli artist Nevet Yitzhak. The exhibition will open on Thursday, May 14 and will be on view through Saturday, July 10, with an opening reception for the artist on Thursday, May 14 from 5:00 – 8:00 pm. This is Yitzhak’s first exhibition at the Gallery. Nevet Yitzhak creates large-scale video installations with appropriated images that re- contextualize current social and political conditions. The artist applies her own narratives to Islamic and Middle Eastern objects, questions their cultural associations throughout history and examines how cultural categories construct identity, with an emphasis on the distinctions between East and West. In her animated videos, adopted cultural symbols and traditional aesthetics are rendered as moving three-dimensional objects, which correspond with borrowed imagery and sounds. With these juxtapositions, Yitzhak explores the overlooked pre-digital past of Middle Eastern art through a contemporary lens. 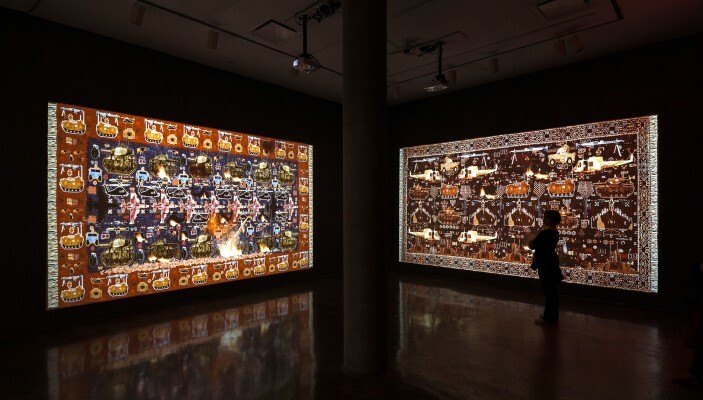 For the video installation WarCraft , Yitzhak adapts contemporary Afghan war rugs for the digital screen. These rugs were first created by rural Afghan women as a reaction to the 1979 Soviet invasion. Whereas weavers had previously used traditional decorative patterns, these women introduced battlefield motifs into the imagery. Images of guns, tanks, airplanes, maps, warriors and leaders are woven into the textiles, transforming the customary decoration into a complicated tableau of political battles. 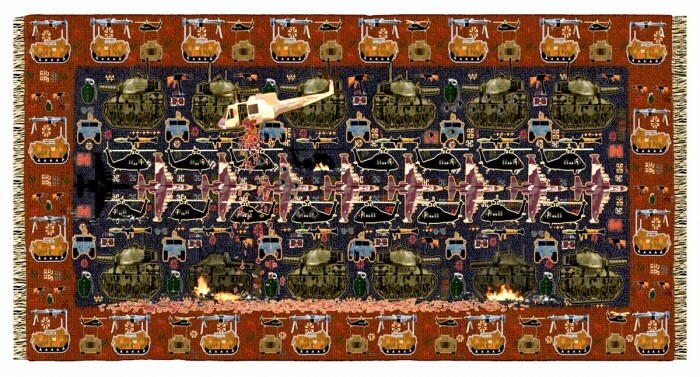 Yitzhak creates her own war rugs from scratch and brings them to life in the form of 3D animations engaged in active battles. With an added soundtrack, WarCraft resembles a violent video game: planes fly from one rug to the next, dropping bombs that burn holes in the fabric, while tanks fire across screens, creating bullet holes. The battlefield is no longer a distant place evidenced on the news – it is made intimately visceral, surrounding its viewers in the action of war. But in Yitzhak’s war, there is no winner; the battle rages on in endless loops, becoming a reflection of the seemingly endless wars around the world. 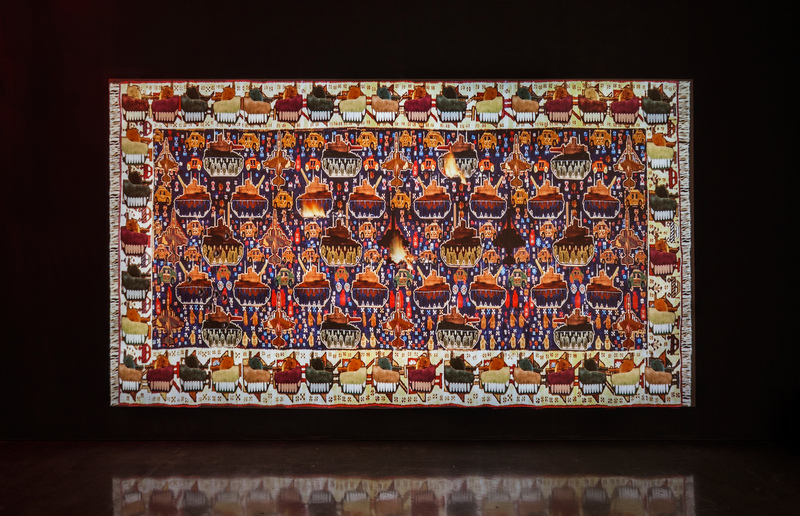 The video installation Orient Express presents three pieces from an eight-channel video that was created for and inspired by the Museum of Islamic Art. After extensive research of the museum’s collections, Yitzhak selected relics related to liturgical practices and everyday functions, including a ceramic plate, a sword, and an illustrated manuscript. 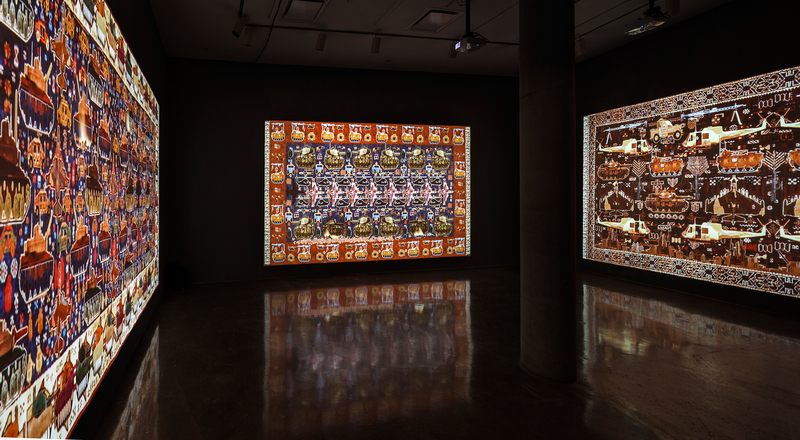 The photographic reproductions of these objects, which she color edited, enlarged and animated as three-dimensional digital models, form a video collage. The decontextualized artifacts, with Yitzhak’s imagined histories and fictional allegories, become totems that harken back to early cinema’s fascination with the Middle East. A 17th-century Mughal ivory-ornamented chest, for example, opens to unveil an old television broadcasting the 1950s CBS quiz show What in the World? in which a panel of experts attempt to identify archeological objects submitted by viewers. 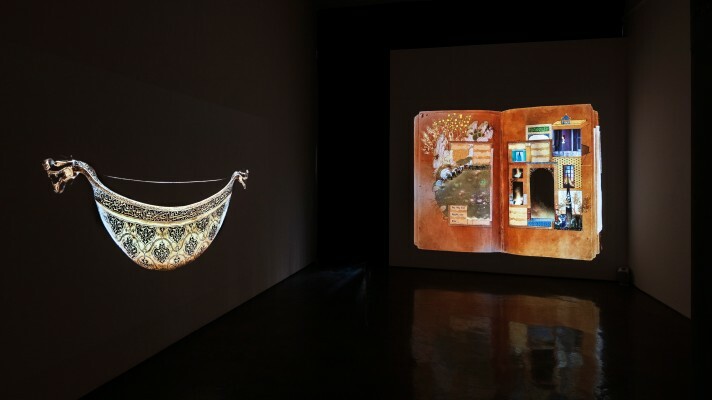 Throughout Orient Express , the museum objects interact with a variety of borrowed images and videos, forming Yitzhak’s hybrid chronicle that simultaneously challenges and re-discovers the perceived history of Islamic art. 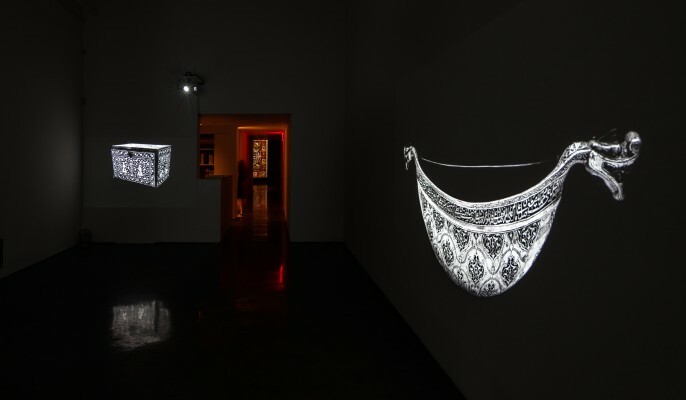 Nevet Yitzhak’s work has been included in exhibitions at Noga Gallery of Contemporary Art, Israel; Mayer Museum for Islamic Art, Jerusalem; Koffler Gallery, Toronto; Shpilman Institute for Photograph, Tel Aviv; Andrea Meislin Gallery, New York; Martin Gropius Bau Museum, Berlin; and Stedelijk Museum Bureau, Amsterdam. The artist’s work is included in the collections of L.A. Mayer Institute for Islamic Art, Jerusalem; Tel Aviv Museum of Art; The Israel Museum, Jerusalem; The Petach Tikva Museum of Art; and Shpilman Institute for Photography, Tel Aviv. Nevet Yitzhak is the recipient of many awards, including the Artist Book Grant from the Israel National Lottery Council for the Arts in 2014; the Landau Fund Prize for Arts and Sciences in 2014; The Beatrice S. Kolliner Award for a Young Israeli Artist, The Israel Museum, Jerusalem in 2014; the Shmuel Givon Prize for New Art from the Tel Aviv Museum of Art in 2013; and the Creative Encouragement Award from the Israel Ministry of Culture and Sport in 2012. Ms. Yitzhak was born in Israel in 1975.